Life has never been easy, and for those who want to fight it, it will be even harder. This is true with the fate of Batool, a girl who struggled with all the problems of life and achieved great things. Batool Naseri, an Afghan immigrant living in Iran, speaks about her life full of difficulties and hardships. Batool was born in a religious and conservative family that opposed the idea of female members of the family working outside. She is the fifth child of her 10-member family. She graduated from high school majoring in child training and completed her associate college in the field of Islamic science and education. Ms. Naseri earned her BA in Islamic Theology from the University of Jamiat-al-Zahra in Qom. Her father, who is no more now, was a writer, scholar, and lecturer, and he too spoke to all women and men. Batool now lives with her mother and two sisters in Qom. She has to spend 5 days in Tehran and 2 days in Qom each week. Her mother is ill and suffers from diabetes, high blood pressure, fatty blood, liver and kidney damage that needs dialysis. As a teenager, she was a shy and isolated girl, to such an extent that she was embarrassed to greet others. After enduring this difficult period, she sought to find a solution to eliminate the sense of embarrassment and enter the outside world, thus she began to work at the age of 18 for financial independence, while she encountered the prohibition from her father. But she stayed strong and could finally convince him. Although, relatives expressed their dissatisfaction with the issue, Batool did not pay much to these concerns. “The year my father passed away, I was severely depressed, and my depression and mental condition affected my education, and my grades dropped in class as a result,” said Batool, who lost her biggest support, her father, in 2012. Batool continued to explain that “Two months past this decision, one day the teacher questioned my decision to participate in the class and commented that I was very weak to attend the class, that it would not work for me. Although I was saddened by this, I did not stop and tried my best to make a change”. “I can never forget the moment when the teacher said: “I cannot believe, you were great!” and that’s how I made my first speech to the students of Qom Azad University of Midwifery Studies”, she said. 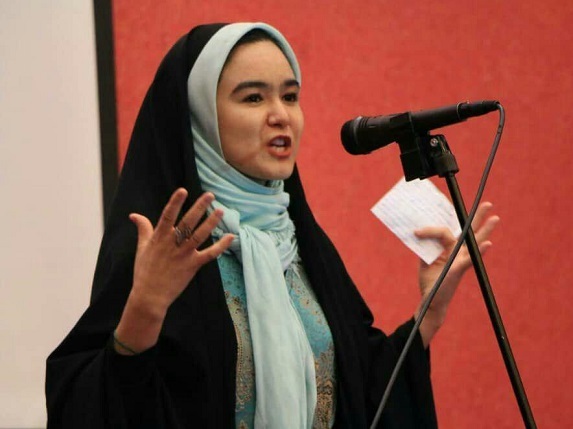 Batool Naseri delivered her second lecture in Tehran’s Roodhen, and later on, for two consecutive years, at different festivals on Afghanistan. She completed the public speaking, theatre and presenting courses in 2015. 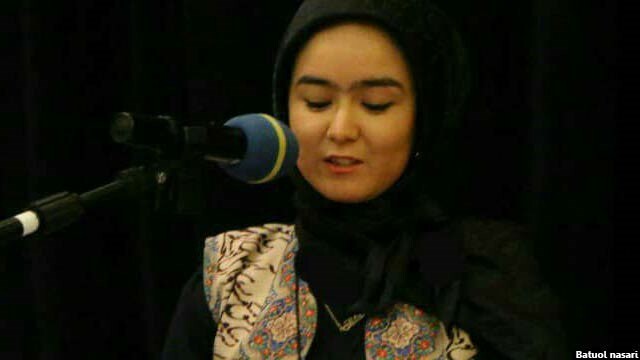 Her public speaking teacher was “Ershad Ehrari”, who encouraged her with the most beautiful speech. Being aware of her abilities, Batool decided to learn this skill with more dedication under the supervision of skilled Iranian teachers. According to her, the public speaking courses contributed greatly to her personal development and purposefulness. Although she has gone through many challenges, the young lady is encouraged by Ershad Ehrari, Mehdi Sadeghloo, Hossein Abedini, Morteza Shahtorabi, and Masumeh Ahmadi, her older sister-in-law. 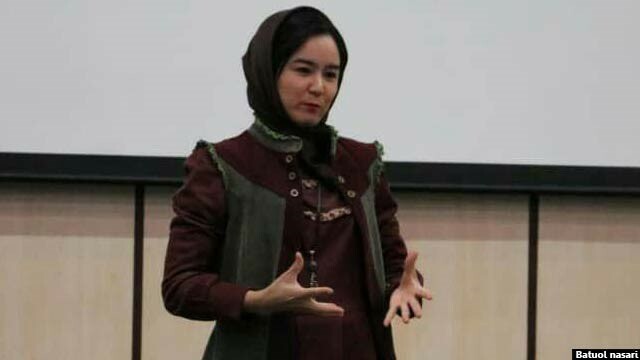 After holding many public speaking courses for Afghan young immigrants; she also held two public speaking sessions, the first of which was attended by 70 in Tehran, and the second with 150 participants at the University of Mofid in Qom. 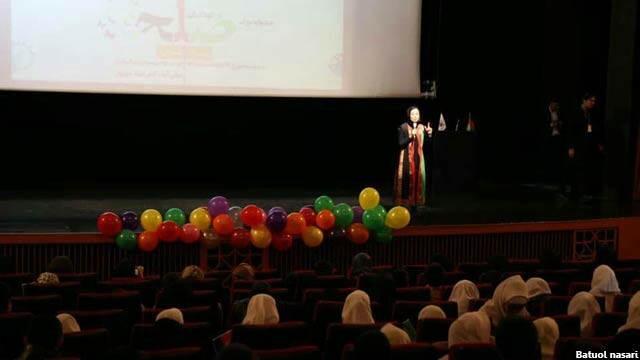 Batool teaches public speaking skills to the children of first to ninth grade at Safiran Mehr Aseman School in Shahr-e-Rey of Tehran. Also, Ms. Naseri is the presenter of the 90-episode TV show for kids and teenagers in Iranian children’s channel called “Hod Hod”. “The problem with this community is that it’s a mistake for women to talk to men, while Hazrat Zeinab made a speech 14 centuries ago, and today I want to make the whole world aware with my very own voice that women should shine in all areas and there is no limit “, she said. One of the challenges this young speaker is facing like most of the immigrant young people, is to get a license to work across sectors. Batool was not an exception either. She needed a license to set up her public speaking classes, but this opportunity has never been given to the immigrants. Batool Naseri held her first club in cooperation with theatre “Mam Meyhan” and completed her second club with the assistance of the university. “The good thing about the program is that I’m going to universities and I conduct my programs with an agreement with them while using their license,” Batool said. The young speaker has decided to hold her third and fourth club in the cities of Tehran and Isfahan this coming February. Batool believes that if her father was alive, he would have supported her in all these adventures and helped her attain success sooner. However, she is still happy and glad that her mother now believes in her and is certain that Batool, can make progress and that, is enough for Batool. 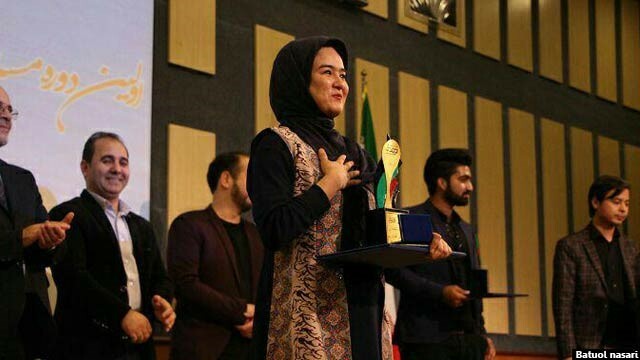 Batool managed to draw her mother’s attention, when she first appeared on Iranian television and was featured in a program called “Pelak 16” as the “Top Storyteller”. She was able to convince her family and mother that she could do this, but this was still not normal for them, until finally, their full satisfaction came with the release of the 90-episode program recorded on HodHod Channel, in which Batool appeared as the presenter. She initially earned around AFN 3,500, and currently earns almost AFN 40,000. “My goal is to make education pervasive among the Afghan refugees and young people so that they find their goals and ways to achieve them,” Batool added. Batool is keen to teach public speaking skills to Afghan children and teens. In fact, Batool, with this beautiful idea, is looking for a big change for her generation.